Our laboratory focuses on discovering improved treatments for epithelial ovarian cancer using laboratory and clinical studies. Building a molecular classifier—how many types of high grade serous ovarian cancer are there? The key genomic features of high grade serous ovarian carcinoma (HGSOC) are ubiquitous TP53 mutation and profound genomic instability causing highly abnormal copy number (CN) and structural variation (SV). We have exploited these to develop potential molecular classifications of high-grade serous ovarian cancer (HGSOC). We have optimised our low-cost tagged amplicon sequencing of TP53, resulting in more accurate mutation calling and variant allele fraction estimation for FFPE and cell free DNA. We have used these assays to validate the performance of p53 IHC as a predictor of TP53 mutation and establish sensitivity and specificity parameters. Our methods have direct clinical impact and have been incorporated as exploratory endpoints in clinical trials. In addition, we are translating these assays and analysis pipelines into the clinic for use in women with HGSOC. Recently, we have adopted a low-cost, low-coverage, whole-genome sequencing approach to interrogate the copy-number landscape of HGSOC in a clinical setting. We have developed a bioinformatic method that estimates tumour purity and ploidy from shallow WGS using TP53 mutant allele fraction in order to get absolute copy-number. Application of this to a cohort of 300 samples revealed distinct copy-number signatures. Looking further forward we plan to leverage the observation made by others that subtypes of HGSOC have immune related gene expression signatures – we will overlay matched H&E image analysis, quantifying immune cell infiltration, with our tagged amplicon and copy-number sequencing to attain a more comprehensive classification. Circulating tumour DNA is a promising non-invasive biomarker that can provide highly specific genomic information in women with HGSOC (Figure 1). Figure 1: Schema of workflow for circulating tumour DNA analysis. We have demonstrated that ctDNA TP53 mutant allele fraction is correlated with tumour volume (Figure 2) and that a decrease after cycle 1 is associated with longer time to progression. It appears that ctDNA is promising as a predictive and prognostic biomarker in a relapsed setting and we are now validating these findings in further cohorts from other clinical trials. 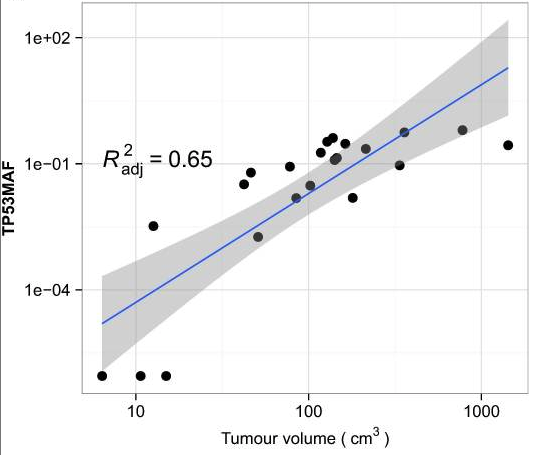 Figure 2: Linear regression analysis of TP53MAF with tumour volume in 22 relapsed events without ascites. Grey shading shows 95% confidence intervals between tumours subsequently resistant to paclitaxel and tumours resistant to carboplatin (p=0.044; Student 2-sided t-test). ctDNA has the potential to provide biomarkers of high clinical utility for cancer diagnosis and monitoring in HGSOC. We will transfer our optimized ctDNA assays into the clinic for implementation in wider clinical trials. In vitro and in vivo tumour models to study HGSOC are very limited. Our aim is to establish reliable pre-clinical model systems that can represent the complex genomic profiles and intratumoural heterogeneity of HGSOC so reagents can be used in functional screens and the discovery of therapeutics and predictive biomarkers. We have carried out systematic culture experiments to develop 2D cell lines which show that primary HGSOC cells have a highly reproducible limited lifespan when grown as in vitro. We have optimized conditions to grow primary ascites cells in suspension and have tested with RNAseq the similarity between primary ascites spheroids and established cell lines grown in 3D using low attachment media. We have started to develop methods for organoids grown from primary cells and demonstrate improved survival compared to 2D methods. We are developing established HGSOC xenografts for long term maintenance of HGSOC populations and have optimized methods for tumour disaggregation, freezing and transplantation. To investigate the cellular heterogeneity within HGSOC, we have used a combination of multi-parameter flow cytometry and in vitro and in vivo functional assays to interrogate the growth and differentiation properties of phenotypically distinct cell populations present within freshly isolated, non-cultured HGSOC tissues. We have established proof-of-principle methods for characterizing and screening patient-derived ascites spheroids in high-throughput assays and for the establishment and functional interrogation of PDX xenograft models. Shared heritability and functional enrichment across six solid cancers.